The 429 Cobra Jet was a V8 engine offered by Ford Motor Company in the early 1970s that was a performance version of its regular 429 engine. 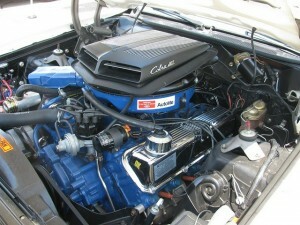 This engine was primarily known for its use in the Ford Torino and was a part of the Ford 385 engine family. The 385 name came from the 3.85 inch crankshaft stroke that was available in this engine family. There was also the Super Cobra Jet which offered and additional bump in performance. The Super Cobra Jet was only available with a final drive of 3.90 or 4.30, while the regular Cobra Jet was available coupled with a 3.25:1 final drive ratio. The 429 Cobra Jet and Super Cobra Jet were not unlike many of the other specific engines in that era that did not have a very long production life. The standard 429 engine was first introduced in 1968, but the 429 Cobra Jet did not become available until 1970, with the 429 Super Cobra Jet becoming available in 1971. The production life of the Cobra Jet was very short with it being phased out in 1971. Although the officially published power numbers for the 429 Cobra Jet were only slightly greater for the regular 429, the hardware differences and reviews would lead one to believe that the delta was much greater. During this time, it was quite common or the manufacturers to sandbag on power numbers to allow for lower insurance rates. The power of this engine made it very popular for performance enthusiasts. The 429 Cobra Jet was advertised as having 370 horsepower at 5400 RPM and 450 lbs-ft of torque at 3400 RPM. These ratings when compared to the standard 429 provided an extra 10 horsepower; however the peak torque was 30 lbs-ft less than with the standard version. This is quite hard to believe given the higher flow carburetor (100 cfm more), considerably larger valve setup, and increase in compression ratio of 11.3:1 compared to 10.5:1 for the base version. Many would estimate that this engine in stock version would likely be much closer to 400 hp. The Cobra Super Jet included an additional set of upgrades to the Cobra Jet but was only advertised as providing an additional 5 horsepower. These engines all came in 429 cubic inch displacement, as you can gather from the engine name. This works out to 7.0 liters. This engine had a bore of 4.36 inches to go with a stroke of 3.59 inches. The head and block of this engine were constructed of cast iron. The Cobra Jet version offered cast iron intake manifold and stamped steel rocker arms. The cobra jet engine used cast pistons while the super cobra jet used a forged manufactured piston. The valvetrain used the common pushrod overhead valve system with 2 valves per cylinder, one intake and one exhaust. The cobra jet valvetrain used guide plates and hardened pushrods, with the super cobra jet using solid lifters. This is in contrast to the base version which utilized bottle neck rocker studs and self-aligning rockers. The 429 Cobra Jet engine was without a doubt an engine that was much stronger than the numbers indicated. The combination of the 429 Cobra Jet engine in the Ford Torino is still a classic combination. This engine was only available in normal production for a few years but is without a doubt still being used across the United States. The upgrades included in the 429 Cobra Jet made it a popular upgrade for those with the extra money to spend.